Ever since the MacBook and MacBook Pro arrived in 2006 and brought about the end of the cult-favorite 12-inch PowerBook G4 model, fans of small, light laptops have been hoping that Apple would come out with a Mac that was smaller than the 13-inch MacBook. With the introduction of the MacBook Air, Mac users now have a three-pound laptop to call their own. But in making this three-pound, .16-to-.76-inch-thick laptop, Apple had to make compromises. For the reduction in size and weight, many small PC laptops trade off such attributes as the size of the display and keyboard, processor speed, battery life, and included features. Most also cost more than a comparably-featured larger model. The MacBook Air is no exception. What makes the MacBook Air different is that, in typical fashion, Apple has chosen to make different compromises than those found in most other subnotebooks. You likely have questions about this latest laptop from Apple. Here's what we've been able to find out about the MacBook Air while waiting for our models to arrive. So what exactly is the MacBook Air? Meet the MacBook Air, the newest entry to Apple’s laptop line. It’s Apple’s entry into the lightweight portable computer market known as the subnotebook, often used by business travelers and popularized by companies such as Toshiba and Sony. At the risk of sounding obvious, the MacBook Air is incredibly light and tiny. Its looks owe a lot to the MacBook Pro and previous silver Mac laptop models, but its curved edges and tapered shape are unlike anything we’ve seen on a Mac laptop in a long time, if ever. You could even think of it as a really big iPod nano. Didn’t Apple try this a long time ago with the PowerBook Duo? The PowerBook Duo series and the PowerBook 2400c were previous Apple forays into the subnotebook market. Neither of them lasted. The Duo models were unique for being dockable—you could insert them into a docking station, where they’d gain ports, connection to an external display, keyboard and mouse, and even access to a faster processor. The 2400c, which was designed for the Japanese market, never made a huge splash in the U.S. The MacBook Air doesn’t offer a docking station like the PowerBook Duo… at least, not yet. Unlike the MacBook and MacBook Pro, the MacBook Air isn’t designed to be a general-purpose computer; it has, by design, limitations that will be unacceptable for many people. People who want the smallest, lightest laptop possible and are willing to sacrifice other features to get it, have probably already placed their orders for the MacBook Air. If you carry a laptop everywhere you go, but don’t need all the power and ports of a full-sized laptop, it’s worth serious consideration. Although you can configure some additional options, the base 1.6GHz model costs $1,799, $300 more than the top-of-the-line 2.2 GHz black MacBook, and $200 less than the low-end 2.2GHz 15-inch MacBook Pro. Or you can go wild and configure yourself an ultimate MacBook Air for $3,098—almost $300 more than the 2.8GHz 8-core Mac Pro. (Most of that extra cost comes from one particular hard drive option—more on that shortly). Why is it more expensive than a MacBook if I’m getting less? It takes a lot of work (and a lot of specialized tiny components) to fit an entire computer in a tiny enclosed space. Bigger components are cheaper than smaller ones. As a result, subnotebooks generally cost more than their larger cousins. Calculating the value of a subnotebook requires different math than your standard laptop: the features you’re paying for are not processor speeds or storage sizes, but weight and volume. If you don’t see low weight and tiny volume as important features in a laptop, the MacBook Air is not for you. Three pounds. For reference, the MacBook weighs 5 pounds, the 15-inch MacBook Pro, 5.4 pounds, and the 17-inch MacBook Pro, 6.8 pounds. The wedge-shaped laptop actually tapers from 0.76 inches high at the back to 0.16 inches at the front. In terms of its width and depth, it’s actually almost identical to the MacBook, at 12.8 inches wide and 8.9 inches deep. A combination of factors went into the MacBook Air’s design. Its main circuit board is remarkably small—Apple took a photo of it next to a pencil for comparison purposes—and packed with electronics. There appear to be no accessible RAM slots. Most standard Mac ports were omitted. There’s no optical drive. Apple even had to call in Intel to create a special, smaller version of the Core 2 Duo processor. And the battery isn’t removable, which allowed Apple to save a lot of space by omitting a battery-access compartment. No optical drive? How am I supposed to watch movies or install software? Apple’s guess is that you’ll have another computer in your house or office with a built-in optical drive. That’s why it’s included the new Remote Disc software with MacBook Air. After you’ve installed Remote Disc on any Mac or PC with a CD or DVD drive, the MacBook Air can connect to that computer and read the disc in the drive as if it were its own. When you click on the new Remote Disc item in the Finder’s sidebar on the MacBook Air, you’ll see a list of all the computers on your local Bonjour network that have Remote Disc installed. Click on a computer and one of two things will happen—either you’ll just take control of the drive, or (optionally) the user of the other computer will be prompted to allow you to take control. If your MacBook Air has a catastrophic problem and you need to reinstall Mac OS X, you can even do that via a Remote Disc. As for watching movies, Apple suggests you use an iPod, iPhone, or iTunes to watch movies instead of playing a DVD. What if I’m not around other computers when I need an optical drive? If you’re afraid that you’re going to run into a situation where you simply must have an optical drive, Apple will sell you an external $99 USB-powered SuperDrive, nicely color-matched, specifically for the MacBook Air. You mentioned it only has a few ports—what are they? 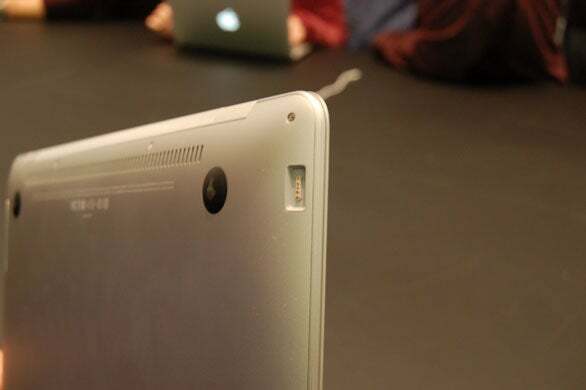 On the left side, near the back, is a slightly recessed space on the MacBook Air’s underside with a MagSafe power connector. As a result, the MacBook Air comes with a different power brick, a smaller 45-watt brick than the one the MacBook uses. And the adapter’s tip is different, a right-angled silver shape that’s designed to nestle snug against the MacBook Air’s side. On the right side is a drop-down door with three ports (it’s not a door that you flip open to expose the ports—you actually pull the door down, and the three ports come down from within the computer). There’s a standard speaker/headphone minijack, a USB 2.0 port, and a micro-DVI port. Yes, IT people, this means you will need to carry around yet another spare set of Mac laptop display adapters—mini DVI for MacBooks, DVI for MacBook Pros, and micro-DVI for MacBook airs. The good news is, MacBook Air ships with two video adapters in the box, one for VGA, one for DVI. An optional $19 adapter with S-Video and composite is also available. Tell me more about the micro-DVI port’s powers. Though the MacBook Air uses the smaller micro-DVI port rather than the MacBook’s built-in mini-DVI, the computer otherwise has the same video capabilities as the MacBook: it will drive external displays as large as 1,920-by-1,200 pixels, including Apple’s 23-inch Cinema Display, and can use that display as either an additional display or as a mirror of the laptop screen’s contents. The MacBook Air also uses the same Intel GMA X3100 integrated graphics processor with 144MB of shared memory as the MacBook. Speaking of displays, did Apple have to shrink the MacBook’s screen to fit in the MacBook Air? Thankfully, no. 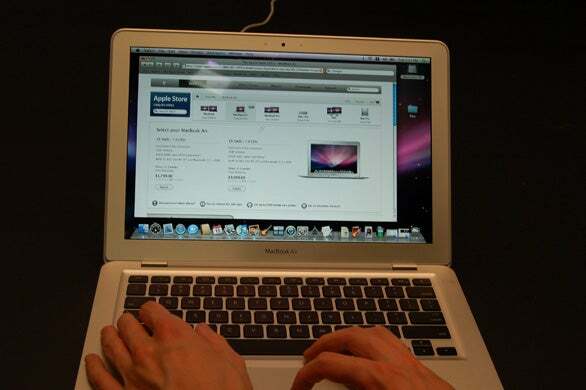 The MacBook Air also has a 13.3-inch widescreen display with 1,280-by-800-pixels resolution. It also includes a built-in iSight camera. Great. Are there any differences between them, though? Yes, the MacBook Air uses an LED (light-emitting diode) for its backlight, just like the MacBook Pro. Apple says the LED backlight produces vibrant colors while saving energy. According to Apple, the LED backlight also reaches full brightness immediately after being turned on, as opposed to other backlights that take a little while to brighten up. I don’t see any mention of Ethernet. That’s because the MacBook Air doesn’t have it. If you need Ethernet connectivity, Apple will sell a $29 10/100BASE-T USB Ethernet adapter that connects to the USB port. Then how do I connect to the Internet? The MacBook Air includes 802.11n wireless networking, as well as Bluetooth 2.1 + EDR for mice and the like. This is the first Mac in a long time without a FireWire port, meaning you probably won’t be using it for traditional camcorder-style video capture. Also, there’s no Kensington security slot. What is the keyboard like? It’s a full-sized MacBook-style keyboard, complete with square keycaps, in black. The keyboard is backlit, similar to those on the MacBook Pros, with an ambient light sensor that automatically adjusts keyboard illumination. There’s even an embedded numeric keypad (for use in conjunction with the Num Lock key), something Apple removed from the last round of MacBook keyboards. The trackpad is capable of recognizing multi-touch gestures, similar to using an iPhone or iPod touch. (You can watch Steve Jobs demonstrate that feature in this video.) The Keyboard & Mouse preference pane lets you turn on certain gestures and provides videos to show what they do. There are gestures to move a window, pan around a photo, rotate a photo, scroll between photos, and pinch a photo to zoom in as with an iPhone. Gestures use one, two, or three fingers. One byproduct of the trackpad’s newfound skills is that it’s disproportionately large when compared to the size of trackpads found on the MacBook or MacBook Pro. What kind of storage does the MacBook Air have? The MacBook Air comes with a 1.8-inch, 80GB, 4,200-rpm Parallel ATA hard drive. But users can upgrade to a 64GB solid-state drive (SSD) with no moving parts. Although it gives you less total storage, SSD is faster and more durable than a regular hard drive (just like the flash-based storage in an iPod nano, for example). That sounds pretty cool…why didn’t Apple just use SSD? High-capacity solid-state drives are new, and as such are very expensive right now. The upgrade will run you a cool $999 from Apple, so there’s a high price to be on the cutting edge. Will that SSD drive be super-fast and super-quiet? While we won’t know for sure until we test it, generally solid-state laptop drives for PCs have been hailed as being faster than traditional laptop hard drives. (And since we’d expect the MacBook Air’s stock 1.8-inch drive to be a bit poky, the speed difference could be notable.) Of course, with no moving parts, SSD drives are silent and shock resistant and use less power than traditional hard drives. What kind of processing power can I expect? The MacBook Air’s processors aren’t as speedy as the ones on the MacBook Pros or even the current MacBooks. It’s powered by an Intel Core 2 Duo processor running at 1.6GHz, or you can order one powered by a 1.8GHz processor for an additional $300. Both processors include 4MB of shared L2 cache running at full processor speed, and share the laptop’s 800MHz system bus. By contrast, the entry-level MacBook has a 2GHz Core 2 Duo chip and the same amount of L2 cache as the MacBook Air. The entry-level MacBook Pro runs on a 2.2GHz chip, also with 4MB of L2 cache. On the next page of this article, you'll find a more thorough comparison of the various laptops Apple offers. How long will the battery last on a charge? Apple says you can get up to five hours of battery life from normal use, with Wi-Fi turned on, but your results may vary. If I’m going on a long trip, can I bring an extra battery like I do with my current Mac laptop? No. Like the iPhone, the MacBook Air’s battery is not user-accessible. And also like the iPhone, if you need the battery replaced, you’ll need to send your laptop to Apple (and pay $129 if it’s out of warranty). So what are my other options for staying power-up on long flights? At this point, all you can do is buy the $49 Apple MagSafe Airline Adapter and hope that your seat has a power plug next to it. (Check out SeatGuru before booking your next flight to find out which planes and seats offer power). 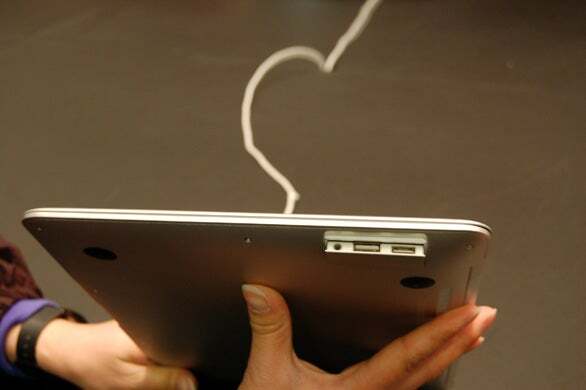 It’s possible that companies may create external batteries that use the MacBook Air’s MagSafe power connector, but Apple has yet to license the port’s use to third-parties, so we just don’t know. It comes with 2GB of RAM, but I like to max out my systems—is there a built-to-order option for more RAM? The fact that the MacBook Air includes 2GB of RAM standard is both the good news and the bad news. Good in that it’s twice as much as many other Mac models for the base price, but bad in that the RAM is, as Apple puts it, “onboard,” meaning it’s probably attached to the motherboard rather than in normal slots, meaning you can’t upgrade. If it’s got an infrared port on the front, that means it comes with an Apple Remote, right? Nope. Unlike all the other MacBooks, the MacBook Air doesn’t have a remote in the the box. If you need one, perhaps you can steal it from some other computer in your house. If your attempts at theft fail, you can buy one from Apple for $19.